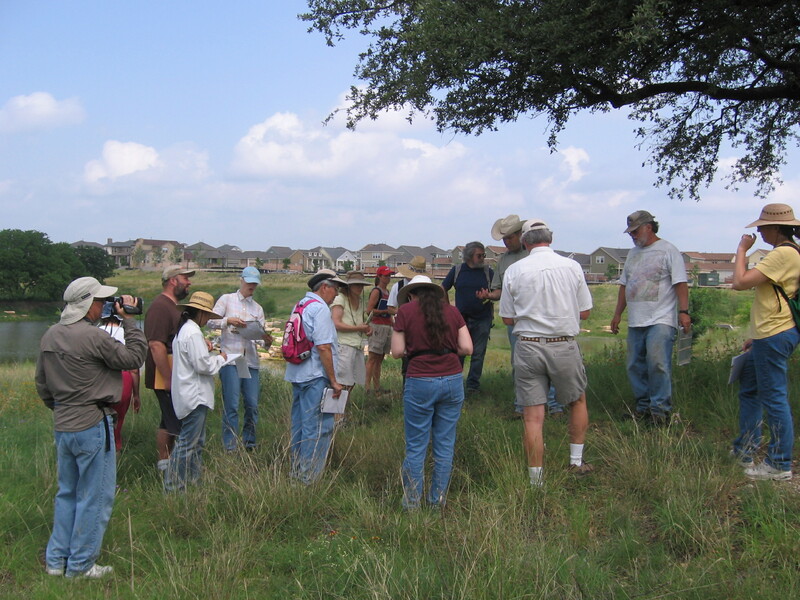 Located near Mueller’s first neighborhood along Tom Miller St. there is a restored Texas blackland prairie incorporating native plants in partnership with the Lady Bird Johnson Wildflower Center. This park provides educational amenities about the ecosystem and prairies of Central Texas. The Mueller site lies within the Blackland Prairie of Texas, part of North America’s Tall Grass Prairie – historically the largest ecosystem in the U.S., but now one of the nation’s most endangered habitats. The habitat generally includes mixes of grasses and wildflowers with woody vegetation being scattered mottes or along riparian corridors. The plant communities range from large patches of wildflowers to grassland prairies to dense woodlands, all at different spatial scales. The design can range from informal “wilderness” to formal designs with well-defined edges which can provide greater visual appeal and sometimes greater interpretive value. The mixed grass prairie contains first rung species on the early-successional ladder. Short grasses make a smooth transition to productive tall grasses with oaks. The Texas Blackland Prairie is part of tall grass prairie stretching from Manitoba to the Texas Gulf Coast. Characterized by a high degree of plant diversity, the deep Texas Blackland soils historically supported tall grasses prairies.he mowed parts within the prairie formalize the prairie giving it a deliberate designed appearance, making it non threatening and providing visibility for parents. The short grass savanna is filled with short grasses and wildflowers in the open spaces between the existing trees becoming a usable prairie for picnics, play and relaxation. All of these areas surround the pond, soft access to the water brings people into this natural area wile a wide range of plants flourish at the water's edge providing food and habitat for wildlife including birds, fish, frogs, crawfish and turtles. A group of volunteers called Friends of the Mueller Prairie leads the effort to remove invasive species. The friends will also work to improve the biodiversity of the prairie and other parts of the greenway. Their work is in support of the Mueller P.O.A. in coordination with expert prairie consultants. The Friends group holds educational workshops, as well as work days in the prairie. Come say hello if you see a group of your neighbors toiling in the prairie! These plants did not just appear by magic! They are the result of work undertaken by a partnership among Catellus, RVI, the Lady Bird Johnson Wildflower Center, the Mueller Community Associations (MCA), and the Friends of the Mueller Prairie. The Mueller Prairie, officially known as the SouthWest Greenway, encompasses 31 acres. It is intended to reflect a part of our natural heritage which has almost entirely disappeared. In Texas, millions of acres of the original prairies have fallen to the plow and other human uses, leav- ing only a few tiny remnants. The Mueller Prairie site was carefully prepared by using soil that was saved during construction activities and seeded with 24 spe- cies of native grasses and 19 species of native wildflowers. Some of these plant species are becoming established and are reseeding themselves. Many other species have appeared spontaneously, mostly from seeds present in the soil (the "seed bank"). But, not all is well in the Mueller Prairie. A number of invasive non- native plants have gotten a foot- hold in the prairie. If these plants are not controlled, they will over- whelm many of the native species. The prairie is located in an urban area which harbors a con- stant supply of invasive plants which can reach the site. Therefore, controlling these unwelcome species will be a long- term process. A group of resident and neighbor volunteers called Friends of the Mueller Prairie has been formed to lead in the effort to remove invasive species. The Friends will also work to improve the biodiversity of the prairie and other parts of the greenway. Their work will be done in support of the Mueller MCA in coordination with expert prairie consultants. The Friends group holds educational work-shops, as well as work days in the prairie. Come say hello if you see a group of your neighbors toiling in the prairie! Many of the spring wildflowers are still blooming, although the overall color is fading as plants go to seed. Plains coreopsis continues to be the most obvious flowering plant. Indian blankets are becoming less noticeable as these annual plants put all of their energy into forming numerous masses of round small grayish seedheads, which will remain on the stems for months after the plants have died. Several attractive stands of purple horsemint are in flower along the trailsides. A few wildflowers which boom in the summer and fall are now leafing out. These include tall Maximilian sunflowers in the "bowl" of the tallgrass area plus camphor weed and gum- weed in other areas. The camphor weed has just begun to flower. Common (annual) sunflowers are also springing up in disturbed spots. Both species of sunflowers flower and seed out simultane- ously, providing food for many species of songbirds. When you see blossoms on the Maximilian sunflowers, look for tiny Lesser Goldfinches busily eating the seeds as fast as they ripen. The males of this species are strikingly colored with black upper parts and lemon-yellow underparts. Females and young have duller plumage. All individuals have white wing patches. Through the heat of the summer, the main event going will be growth and flowering of various grasses. Seeds will be maturing from mid-summer until mid-fall, mak- ing this interval the best time of year for identifying grasses. If you look carefully, you can see that sideoats grama and buffa- lograss are already blooming. Thanks to Cherrywood neighbor, Mary T. Parker for this article. As the summer heat sets in, various grass species are coming into bloom or entering an active growth phase preceding the development of flowers. Blooming grasses you can see now include Sideoats Grama plants and Silver Bluestem plants, as well as a few scattered Upland Switchgrass plants. You may also note Green Sprangletop plants just beginning to unfold their sprawling inflorescences, as well as flowers on some of the smaller grasses, such as Buffalograss. A few summer and fall wildflowers, such as Gumweed and Camphorweed, are beginning to bloom. Otherwise the prairie lacks the exuberant colors of spring. Maximilian Sunflowers in the tall-grass area have not yet produced their bright yellow flowers which will cheer up the prairie during late summer and early fall. Butterflies are returning to the Mueller Prairie. You can see these colorful visitors, as well as dragonflies, any time you walk the paths. Lately small colorful Bordered Patch butterflies have been gathering nectar from the yellow Zexmenia flowers located near the spider sculpture. These insects are also flitting about in weedy areas near Manor Road. So far, I have seen about 20 butterfly species at Mueller. Butterfly populations were low throughout our area during 2008 and most of 2009 because of severe drought and summer heat waves; however, the butterfly species density at the Mueller site has not increased noticeably during 2010. Some 170 species of butterflies have been documented in the Austin area, roughly half of which are regarded as common. So, there are many more species of butterflies that we might be able to lure to the prairie. Part of the reason for the relative paucity of butterflies at Mueller is that the site lacks many butterfly larval food plants (or "host" plants). Female butterflies of each species select certain plant species upon which to lay their eggs. Typically, females of a given species will choose host plants in a particular family or families of plants. If suitable host plants are not present in an area, then species of butterflies requiring those plants will be absent except for adults hatched elsewhere which may move into the area to drink nectar from various wildflowers. However, butterflies are not nearly so choosy about sources of nectar. Therefore, adult butterflies will be found feeding on flowers of species other than their host plants. A second reason for the low number of butterflies at Mueller is that the variety of good nectar plants is limited. A long-term goal of the Friends of the Mueller Prairie is to improve butterfly habitat on the site by the addition of appropriate host and nectar plants selected for species of butterflies known from our area. We will be rewarded by greater numbers of butterflies and a larger number of species living in and visiting our prairie. For general information about Central Texas butterflies, visit the web site of the Austin Butterfly Forum (http://www.austinbutterflies.org). In the withering heat of midsummer, asking "What's up in the prairie?" seems a bit silly. Haven't all the spring flowers already dried up for the year, and aren't the summer ones struggling in the heat? Actually, no. If you go to the Southwest Greenway now and look carefully, you can find a few late-spring bloomers such as pink evening primrose, scarlet gaura, Illinois bundleflower, and Mexican hats still in flower. a long spring-through-fall flowering period continue to bloom. In this category, you can find widow's tears, partridge pea, Texas bindweed, purple bindweed, prairie verbena, frog-fruit, silverleaf nightshade, Ruellia sp., bluets, straggler daisy, and yellow bitterweed. The weather pattern is affecting the development of the prairie grasses too. Most of our native Texas grasses are known as "warm-season" plants. This term means that they begin to show new growth when the weather warms up in the spring. Formation of flowers, pollination by the wind, and seed development follows. In some years, grass seeds may be mature by August, but often they do not mature until well into the fall. grass flowers look like. They are all amazingly similar, with two feathery sometimes brightly colored stigmas and usually three stamens, all enclosed within small bracts. Typically several to many tiny flowers (florets) are borne along a spike; this basic grass floral structure is called a spikelet. Variations in the number and arrangement of the spikelets and minute features of the florets and developing seeds are key characters in identification of the species. Thanks to Mary Parker for contributing another educational and interesting article on the Mueller Prairie. As our long hot summer edges toward cooler fall weather, it seems appropriate to present a brief "wrap-up" of the Mueller prairie development so far. What Plants are Growing in the Mueller Prairie? From May 2009 until now, I have made observations of the development of the vegetation in the Mueller prairie, keeping careful records of the plants I found and related phenological data. Phenology is the study of periodic phenomena in plants. It includes such things as leafing, flowering, and fruiting, and is primarily driven by climatic factors. I have found and identified about 140 species of vascular plants in the prairie (excluding aquatic plants). Eighty-three percent of these plants are native. Seventeen percent of these plants are exotic (originating outside the continental United States). Only 30 native herbaceous species (15 grasses and 15 wildflowers) have come from seeds sown on the site during the original prairie planting. All the other plants on the site are spontaneous, except about 25 native woody species, most of which were transplanted to the site, and one salvaged grass. This means that our prairie is welcoming seeds brought in by the wind, by birds or other creatures. 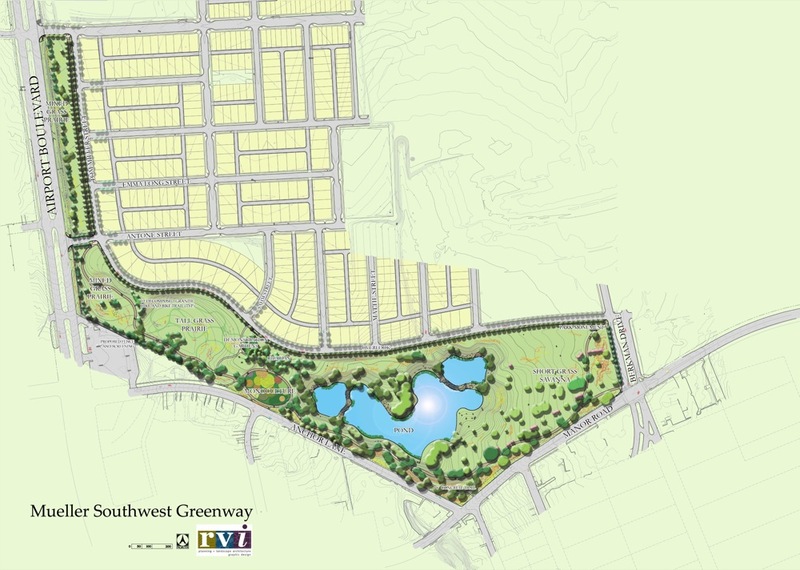 Some of the seeds of native plants may have been dormant in the topsoil preserved by the developers when the Southwest Greenway was under construction. The more diversity of plants, the greater the diversity of wildlife that the prairie can support. Twenty-four species of native perennial grasses were originally seeded in the Mueller prairie. At least 15 of these have come up. The most successful grass so far is sideoats grama (the state grass of Texas). The sideoats grama is functioning as an anchor grass that can impede growth of various unwanted species of both grasses and forbs. The rarest grass I have found in the prairie is Texas cupgrass. I have found only a single blooming specimen of this excellent range plant. In prairie restoration or rehabilitation projects, a general goal is to bring into existence a mixture of perennial and annual species of both native grasses and forbs, with a preponderance of perennials, which represent stability in the long term. With respect to the grasses, our nascent prairie seems to be on a good trajectory! Thanks to Mary T. Parker for this article, a neighbor of Mueller who has graciously volunteered her time to catalog and inform us of plants in the Mueller Southwest Greenway. a scientific overview of some of the sights you’ll see there. have little or no woody tissue, although they do have specialized conducting tissues. These plants often die back to the ground at the end of the growing season. pests because they compete with crop, range, or garden plants for space, light, water, and nutrients. A whole science has developed to study and control weeds. Wildflowers are wild herbaceous plants which are judged to be pretty and desirable by most observers. They belong to an informal category of plants known as forbs. Forbs are herbaceous plants which are not grasses, sedges, or rushes. Forbs include thousands of plants ranging from gorgeous wildflowers to unsightly weeds. Interestingly, as the public has developed a growing appreciation of nature in recent decades, many species which were called weeds in older books have metamorphosed into wildflowers in newer books! plants represents a relatively stable association of species, reducing the need for constant management. This is part of our long-range goal for the Mueller prairie. for our Residents to further appreciation and understanding of the Prairie. In the fall, native grasses in our area are often at their peak, with lovely seed heads on display. Scientific names are included in this issue to help you find informa- tion about the grasses. Every species has one official scientific name which is the same worldwide, whereas many common names may be applied to a single species, and the same common name may be used for different species. Seeds of 24 perennial native grasses were planted on the Southwest Greenway in 2008 to help start the prairie such as big bluestem, purple threeawn, sideoats grama and more. Grama grasses, buffalograss, and curlymesquite are species characteristic of shortgrass prairies, whereas big bluestem, little blue- stem, switchgrass, Indiangrass, and eastern gammagrass are tallgrass prairie notables. The other grasses in the seed mix may occur in various grassland settings. I have found 17 of the seeded grasses growing in the prairie. Sideoats grama is the most abundant, and Texas cupgrass is the rarest. Most species present on the site are shortgrass and mixed grass species. Tall grasses are poorly represented. Indiangrass is the only tall grass which appears to be taking hold. The regular robust form of switch- grass, which is a major tallgrass species, was not planted in the prairie (it may be seen in the demonstration gardens). Instead, upland switchgrass, a smaller less aggressive variety, was planted. About a dozen specimens of this beautiful delicate-appearing grass have ap- peared in the short-grass area. bluestem plants, all of which are rescued transplants, are present. Three of the missing grasses re- quire soil conditions which are not present on the site. Cane bluestem needs loose limey soils and sand lovegrass needs deep sands or sandy loams. Eastern gammagrass requires consistently moist but not continually saturated soils. A few stressed specimens of this grass are growing at the edge of the pond. The apparent absence of Texas wintergrass is unexpected, as this species is a widespread cool-season grass. At least three species of native grasses which were not included in the seed mix have appeared spontaneously in the prairie - common grassbur and two species of bris- tlegrass. Many persons dislike the grassbur because of its spiny seed covering, but the bristlegrasses provide seeds which may be eaten by wintering sparrows. The grass planting effort at Mueller has been successful for the most part. At the moment, the prairie looks rather weedy, bedraggled, and dry, but this situation is not uncommon in our unpredictable climate. The main difficulty continues to be the presence of several unwanted invasive exotic grasses and other troublesome species. The Friends of the Mueller Prairie is working with Valley Crest to address this problem. Purple Prairie Clover - This is an excellent flower that is not often seen in grazed areas because it tastes so good to livestock. It is especially gorgeous, looking like a green cone wearing a purple tutu with yellow dots. Gallardia - Otherwise known as Indian blanket or Firewheel. This is the red flower banded by a circle of yellow. We have hardly any blooming this year due to the drought. The seeds will wait in the soil until conditions are better, maybe next year. Bluebonnets - They had the same situation as the Indian blankets. Better luck next year! Bluebonnet seeds will lie dormant for years. Maximilian Sunflower and Common Sunflower - We have plenty of both coming up this year. Since birds love sunflower seeds, this is a buffet for them. Prairie Verbena - There is some of this low-growing purple flower struggling along. You can also see verbena in the empty building lots around Mueller. Texas Thistle - This is a desirable thistle, a pinkish pompon, attractive to butterflies (especially the painted lady) and to goldfinches. Illinois Bundleflower - There is lots of this low-growing bean relative in the prairie. Later, it will have pompon-type white flowers. Bean-type plants are good for putting nitrogen into the soil. Engleman's Daisy - This yellow flower is an aster and has a greenish center with eight petals. Since it is tasty to livestock, it is not seen much in grazed pastures. Mealy Blue Sage -Tall spires of lavender flowers. Primroses - These are at the end of their bloom season, but were fairly widespread earlier in the spring.